Theoretical studies in curriculum have begun to move into cultural studies--one vibrant and increasingly visible sector of which is queer theory. Queer Theory in Education brings together the most prominent and promising scholars in the field of education--primarily but not exclusively in curriculum--in the first volume on queer theory in education. In his perceptive introduction, the editor outlines queer theory as it is emerging in the field of education, its significance for all scholars and teachers, and its relation to queer theory in literacy theory and more generally, in the humanities. 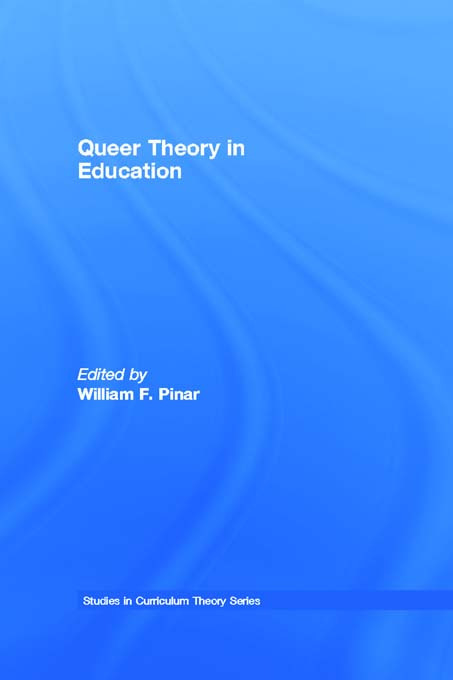 "William Pinar…has assembled a passionate, challenging and academically stretching collection of essays that both re-appropriate the term 'queer' and question the whole process of 'normalisation' in education. " "This is a profoundly North American book which does not skirt controversy. However, in my opinion it does effectively span the Atlantic well in connecting with the UK situation. It is also very rich and varied - sections of dense theory are tempered with lighter interludes on lesbian visibility in the cinema and HIV poetry." "…[Pinar] has assembled a passionate, challenging and academically stretching collection of essagys that both re-appropriate the term 'queer' and question the whole process of 'normalisation' in education." "Pinar and the contributors to this volume have given us a work of major proportions….Do not assume that queer theory limits its concerns to homophobia and gay and lesbian rights. It does not! Though these constitute major themes within the literature, the point of queer theory is to disrupt our comfortable notions of the normal/straight and the transgressive/queer….Queerness is about challenging conventional norms--sexual or otherwise--and is, therefore, connected to a plethora of oppositional politics. Consequently, perhaps, the promise of queer theory for education rests in its potential to open up dialogue among persons from many divergent subjective positions, enabling them to explore the possibilities of coalitional politics and networks of solidarity that could transcend our codified patterns of interest-group politics." Contents: W.F. Pinar, Introduction. W.G. Tierney, P. Dilley, Constructing Knowledge: Educational Research and Gay and Lesbian Studies. J.T. Sears, A Generational and Theoretical Analysis of Culture and Male (Homo) Sexuality. D. Carlson, Who Am I? Gay Identity and a Democratic Politics of the Self. E. Meiners, Remember When All the Cars Were Fords and All the Lesbians Were Women? Some Notes on Identity, Mobility, and Capital. S. Luhmann, Queering/Querying Pedagogy? Or, Pedagogy Is a Pretty Queer Thing. R. Walcott, Queer Texts and Performativity: Zora, Rap, and Community. N. Rodriquez, (Queer) Youth as Political and Pedagogical. S.R. Steinberg, Appropriating Queerness: Hollywood Sanitation. D. Sumara, B. Davis, Telling Tales of Surprise. W.F. Pinar, Understanding Curriculum as Gender Text: Notes on Reproduction, Resistance, and Male-Male Relations. S. de Castell, M. Bryson, From the Ridiculous to the Sublime: On Finding Oneself in Educational Research. K.G. Honeychurch, Carnal Knowledge: Re-Searching (Through) the Sexual Body. M. Morris, Unresting the Curriculum: Queer Projects, Queer Imaginings. M.A. Doll, Queering the Gaze. A.J. Pitt, Fantasizing Women in the Women's Studies Classroom: Toward a Symptomatic Reading of Negation. D.P. Britzman, On Some Psychical Consequences of AIDS Education. R. Platizky, We Were Already Ticking and Didn't Even Know [It]: Early AIDS Works. W. Haver, Of Mad Men Who Practice Invention to the Brink of Intelligibility. J.L. Miller, Autobiography as a Queer Curriculum Practice.